President said he'll call in air strikes against ISIS to protect American interests if necessary. This is an ABC news special report. Crisis -- -- Now. George Stephanopoulos. Good evening we're coming on the air right now because President Obama is about to speak from the white house on the crisis in Iraq. And the US military mission launched earlier this evening to get humanitarian aid to refugees in the north of that country. Of the 101000 -- -- and ancient minority -- in Iraq. Have been driven from their homes by fighters from -- since the Islamic militants gaining strength across Iraq threatening to take control. -- -- are stranded on the -- our mountains surrounded by hostile forces with little food water or medicine no way to escape. ABC's Martha Raddatz broke the news in the air drops earlier today she joins us now from Washington Martha what -- we know about the scope of this mission. As far as I know George there were several US air force cargo planes involved -- US official telling me. There was a C seventeen that massive cargo jet and C 130s. They dropped enormous amounts of aid food medicine water. Over the singe our mountains knowing it was just to catastrophic. Situation the mission has been ongoing for several hours. And they did manage to get that aid to those people on the mountaintop but no air strikes yet. No airstrikes but they are being considered the president was considering that today. Near the city of her -- because there is an American Consulate there and about forty military advisors and he wants to protect. Those Americans at any cost but that's a decision that will be up to the president. This mission has been completed for the night the planes have returned to their -- -- we've been told. By senior defense official the president will be speaking see their from the state dining room. Earlier today the white house Press Secretary Josh Earnest call this humanitarian catastrophe. And here comes the president now. -- -- Today -- authorized to operations in Iraq. Targeted airstrikes to protect our American personnel. And a humanitarian effort to help save thousands of Iraqi civilians. Were trapped on a mountain without food and water. And facing almost certain death. -- explain the actions we're taking and why. First. I -- in June. As the terrorist group -- -- began an advance across Iraq. -- the United States would be prepared to take targeted military action in Iraq if and when we determined that the situation required. In recent days these terrorists have continued to move across Iraq. And -- neared the city of mobile. -- American diplomats and civilians serve at our consulate. An American military personnel advise Iraqi forces. To stop the advance on -- bill. -- directed our military to take targeted strikes against Beisel terrorist convoys should they move toward the city. We intend to stay vigilant. And take action if these terrorist forces threaten our personnel or facilities anywhere in Iraq. Including our consulate in -- -- and our embassy in Baghdad. We're also providing urgent assistance to Iraqi Government and Kurdish forces so they can more effectively wage the fight against -- Second. At the request of the Iraqi Government. We've begun operations to help save Iraqi civilians. Stranded. On the month. As -- was marched across Iraq -- waged a ruthless campaign against innocent Iraqis. And these terrorists have been especially barbaric towards religious minorities. Including Christian. And disease the small and ancient religious sect. Tell -- Iraqis have been displaced. Chilling reports described by some militants rounding up families conducting mass executions. And enslaving. -- dizzy -- -- In recent days you -- women men and children from the area of -- -- have fled for their lives. And thousands perhaps tens of thousands are now hiding high up on the mound. With little -- the clothes on the backs. -- without food. There without water. People are -- And children are dying of thirst. Meanwhile -- forces below have called for the systematic destruction of the entire Israeli people which would constitute genocide. So these innocent -- -- are faced with a horrible choice. Descend the mountain and be slaughtered or stay and slowly die of thirst and hunger. I've said before the United States cannot and should not intervene every time there's a crisis in the world. So let me be clear about why we must act and act now. When we face a situation like we do on that -- With innocent people facing the prospect. Of violence on a horrific scale. -- we have a mandate to help in this case a request from the Iraqi Government. And when we have the unique capabilities to help avert a massacre. And I believe the United States of America cannot turn a blind. We -- -- carefully and responsibly to prevent a potential act of genocide. That's what we're going on that mountain. And therefore authorized targeted airstrikes if necessary to help forces in Iraq as they fight to break the siege for months in jars and protect. The civilians trapped there. Already American aircraft begun conducting humanitarian airdrops of food and water to help these desperate men women and children survived. Earlier this week one Iraqi in the -- cried to the world. There is no one coming to help. Well today America is coming to help. We're also consult -- of other countries and the United Nations who have called for action to address this humanitarian crisis. I know that many of your rightly concerned about any American military action in Iraq. Even limited strikes like -- I understand that. Iran for this office in part to end our war in Iraq and welcome our troops -- that's what we've done. As commander in chief I will not allow the United States be dragged into fighting another war in Iraq and so even as we support. Iraqis as they take the fight to these terrorists American combat troops will not be returning to fight in Iraq. Because there is no American military solution to the larger crisis in Iraq. The only lasting solution is reconciliation. Among Iraqi communities and stronger Iraqi Security Forces. However we can and should support moderate forces who can bring stability to Iraq. So even as we carry out these two missions. We will continue to pursue a broader strategy that empowers Iraqis to confront this crisis. Iraqi leaders need to come together and forge new government that represents the legitimate interest of all the rockets. And -- can fight back against the threats like -- Iraqis have named a new president. A new speaker of parliament. And are seeking consensus on a new prime minister. This is the progress that needs to continue in order reversed momentum of the terrorists who prey upon Iraq's divisions. Once a -- has a new government the United States will work. With it and other countries in the region to provide increased support to deal -- this humanitarian crisis and counterterrorism challenge. None of Iraq's neighbors have an interest in this terrible suffering. Or instability and so we'll continue to work with our friends and allies to help refugees get the shelter and food and water they so desperately need. And to help Iraqis push back against sites. The several hundred American advisors that I ordered to Iraq will continue to assess what more we can do to help train. Advise and support Iraqi forces going for. And just as I consulted congress on the decisions I make today we will continue to do so scornful. My fellow Americans. The world is confronted by many challenges. And -- America has never been able to write every -- that America has made the world a more secure prosperous place. And our leadership is necessary to underwrite the global security and prosperity that our children and our grandchildren. Will depend -- We do so by adhering to a set of core principles. We do whatever is necessary to protect our people. We support our allies when they're in danger. We -- coalitions of countries to uphold international norms. And we strive to stay true to the fundamental values. The desire to live with the basic freedom and dignity that is common to human beings wherever they are. That's -- people all over the world look to the United States of America to -- And that's why we do. Let me close by assuring -- that there is no decision that I take more seriously. -- the use of military force. Over the last several years we -- brought the vast majority of our troops home from Iraq and Afghanistan. And I've been careful to resist calls to -- time and again to our military. Because America has other tools and arsenal than our military. We can also lead with the power -- -- Our economy. And our ideals. When the lives of American citizens are at risk we will take action that's my responsibility as commander in chief. And when many thousands of innocent civilians are faced with the danger of being wiped out. And we have the capacity to do something about. We will take action. As our responsibility as Americans. That's a hallmark of American leadership. That's who we are. Tonight we give thanks to our men and women in uniform. Especially our brave pilots and crews over Iraq for protecting our fellow Americans and saving lives so many men women and children. That they will never meet. There -- present American leadership at its best. As a nation we should be proud of them. There are countries -- to recommend them. To uphold our own security and the dignity of our fellow human beings. Jobless armed forces. And god bless the United States of America. President Obama from the White House explain to the American people why he has asked the US military. To provide aid to thousands of Iraqi minorities face what you -- a potential genocide in the north. That country wanted to Jon Karl at the White House the president also laying out -- authorized. But had not -- they have not happened yet air strikes. To prevent those Islamic militants in that country from taking control the key city in the north. And that was the major step for this president one of the most reluctant things he's been to do order airstrikes in Iraq this is if that terrorist group. Can get to -- -- that's the capital of the Kurdistan in northern Iraq and why that is so significant George is there are Americans in that city. An American Consulate in American military advisors and this president has said -- his top priority is to protect American personnel overseas. And Martha Raddatz those plans are rated team carry out the strikes at any moment. They certainly are George when ever the president says they should go they are armed. And they are ready to go they would just have to figure out a target which could be difficult because crisis blends in with. The community with the civilians but I would suggest that it would probably be against convoys if they move against your bail. OK Martha Raddatz Jon Karl thanks very much that's all for us right now. -- your late local news and Nightline we'll have all the latest tomorrow I'm GM African. This has been a special report. From ABC news. What Is The White House Doing To Address The Humanitarian Crisis In Iraq? 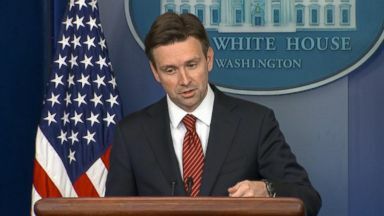 White House declines to say whether President Obama is weighing airstrikes or airdrops. Now Playing: What Is The White House Doing To Address The Humanitarian Crisis In Iraq?